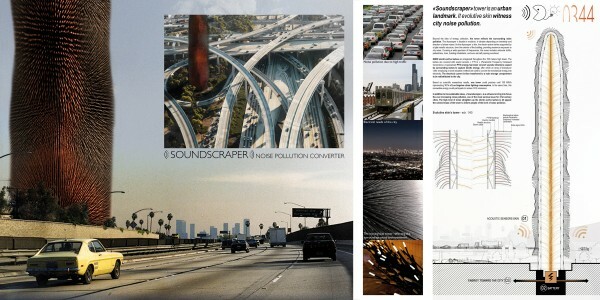 The Soundscraper is located next to main transport infrastructures, mostly outside city centers where noise pollution is at it maximum. Motorway junction, railway hub represent no man’s land in the urban territory and areas of greatest efficiency to produce energy . The skyscraper ‘s facade is evolutive, it vibrates depending on intentisity and direction of urban noises. As the skyscraper ‘s skin, the electro active lashes supported by a light metallic structure, form the exterior of the building, provides maximum exposure to city noise. Covering a wide spectrum of frequencies, this noise includes vehicular traffic, pedestrians, train, building inhabitants, and even aircraft passing overhead. 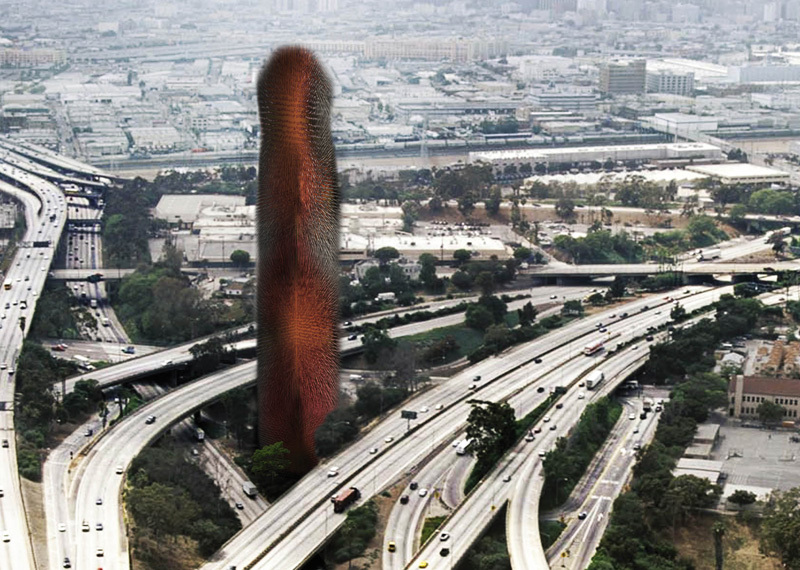 84000 electro-active lashes are integrated throughout the 100 meters high tower. The lashes are covered with sound sensors P.F.I.G (Parametric Frequency Increased Generators). A specialized PFIG energy harvester convert sounds vibrations caused by surrounding noises to capture kinetic energy, after which an array of transducer ‘cells’ employing a novel actuation method are used to convert the mechanical energy into electricity. The electrical current is then transferred to a main storage compartment to be redistributed to the city. Based on scientific researches results, one tower could produce until 150 MW/h representing 10 % of urban lighting consumption of Los Angeles. In the same time, this renewable energy could participate to reduce CO2 emissions. 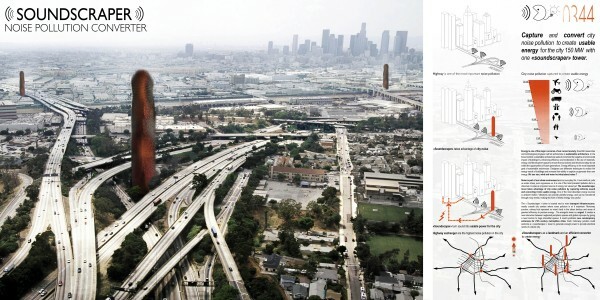 The energetic tower will be a landmark, creating a new interaction between neglected peripheric spaces and global cityscape, by giving a new function to huge interstitial spaces. Each motorway junction could welcome a soundscraper tower to generate enough power to provide electrical needs of a whole city.